Here is the latest from some awesome footage we captured of the sail fishing action in Grenada on the 45 Hatters Exile. Great fishing this season in Grenada! Check out the video and WATCH IN HD!!! I just made it back to the states and will be back on the water in a little over two weeks when I go to FL to take the Over Under back to the Bahamas with Joe Trainor in the middle of March until the end of April. Can’t wait! As always down here in the Southern Caribbean we went hard so it was difficult to keep up with posts and also I was lacking the time to get the internet setup properly to be able to post much. Anyway…. We made the boat move on Friday to Grenada and made a quick deep drop pit stop on a new area I marked during an earlier boat move and it paid off. We caught a few small silky snapper and some nice red snapper for dinner. The seas were relatively calm and made the crossing nice. Saturday we got right to it and it was like we never missed a beat. We ended up getting 10 sailfish bites, but unfortunately only were able to turn 3 of them into releases. It was a very nice day and the action was fairly scattered throughout the day keeping things interesting. Sunday we got right back to it. Early on we saw some bird play and tunas skying out randomly so we gave the tuna fishing a go for a bit with no success. After that the sea went lifeless. We managed to get two sailfish bites but failed to convert either to a release – ouch! Then we caught a nice 30+ pound bull mahi in the blind, but it just seemed off. We picked up and made a 10 mile move to the South and put lines back in. Still seemed fairly dead, but a few flying fish. We hooked into a double header of white marlin and pulled the hook on one early then lost the second on a few feet from the release. Just one of those days I guess. Shortly after that bad luck we did manage to get a release on a white marlin. Tough day. Monday -FULL MOON – GAME ON. We stuck with the program and headed out to the deep. Right away there was some scattered bird play and the porpoises were thick. Unfortunately my depth sounder went out on me on day 1 so I could not confirm if the tunas were there. I fired a tuna bait and heavy rod out on the shotgun to be safe, but shortly after it cost us a sailfish bite, so I took it out, then WHAM, left teaser gets demolished by a yellowfin then the right long with the small ballyhoo with a red Fish DownSea Party Hat gets clobbered and the 20 started screaming, oh boy… Anyway, we fought this fish pretty much all day. We did manage to catch a couple of mahi that were swimming around the boat during the fight. 5 hours and 20 minutes later we did land the big 170# yellowfin. We got back on the troll and caught a few more mahi then missed a blue marlin on the bait and switch. The birds and porpoise came together and we managed to connect on 2 more tunas and had a few other bites. FUN DAY and plenty of spicy tuna rolls at YOLO. Tuesday was our last day and the sails were biting good again. We even saw them balling bait again for about 10 minutes at one point. We went 4/9 and had some bad luck again losing 3 others we had hooked, but all in all still another fun day. There wasn’t as much bird play on the sailfish this trip as the fish seemed a bit more scattered, but the fishing was still very good and consistent. The tunas stole the show again. 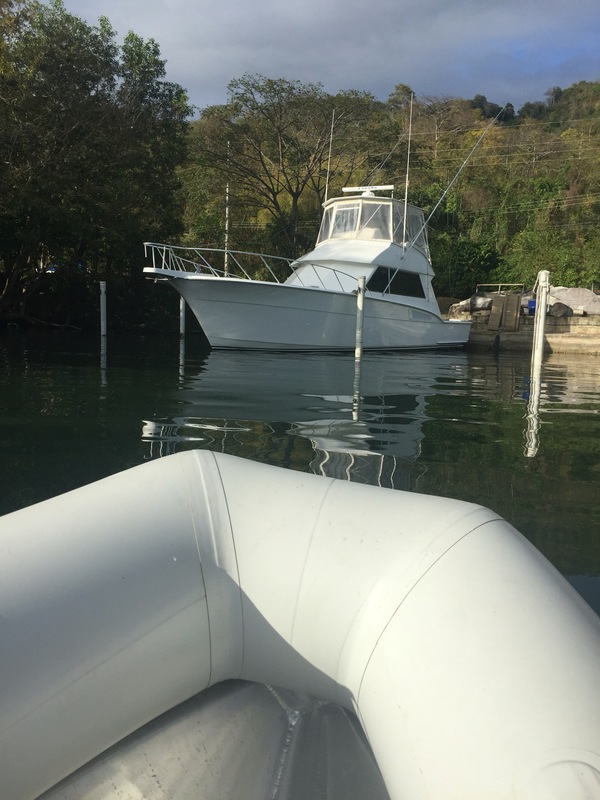 I arrived in Trinidad Monday and it’s been nonstop boat work, rigging, boat work, boat work, rigging, provision the boat, spooling reels, haha. Almost always pays off in the end. I have been getting Exile ready for our second round in Grenada. This trip will only be 4 days of fishing, but hopefully the fish cooperate for us like the last trip. Looking forward to it! Hopefully I will have a little better internet this trip to keep the updates coming! If you follow me you already know how amazing the billfishing was this past January in Grenada. After the Spice Island Billfish Tournament the billfish, and especially the sailfish, continued to bite well, but it was the 100-150 pound yellowfin tuna with the beautiful yellow sickle fins that stole the show. We were lucky enough to get into the action with them on a few occasions, and here is the video of how it went down. Be sure to watch in HD!!! Here is my latest edit that is basically a compilation of action packed billfish explosions and jumps from our 3 days fishing the Spice Island Billfish Tournament in Grenada on the 45′ Hatteras EXILE. Be sure to watch in HD!!! Here is a quick, semi raw edit of the head cam on Mate Nicolas Bovell with a triple header of yellowfins on. The first yellowfin was pretty green and once it was stuck went wild and we ended up snapping the gaff – luckily we still got he fish back and in the boat.